LAGUNA HILLS, California, June 27, 2008 (ENS) - Wherever a large painting of whales appears on the outside wall of a building, it is probably the work of American marine life muralist Robert Wyland, who has painted 99 Whaling Walls across the United States and around the world. 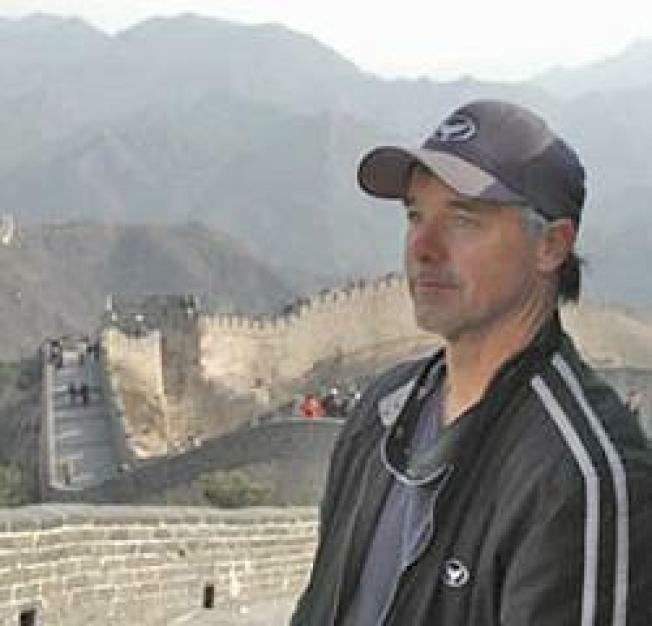 Wyland is about to realize his 30 year goal of painting 100 Whaling Walls by staging the 100th mural in Beijing in advance of this summer's Olympic Games. Student artists from around the world will join Wyland in Beijing from July 7 - 21 to create a pre-Olympic global art project celebrating the world's waters and the future of international cooperation. The mural at the Beijing Olympic International Sculpture Park will span nearly two miles with more than 205 canvasses representing United Nations and Olympic member countries. Called "Hands Across the Ocean," the mural painting event is being organized by the nonprofit Wyland Foundation and U.S. New World Media in cooperation with the China International Youth Cultural Center. Wyland and the young artists will collaborate to paint the world’s aquatic habitats and their inhabitants - manatees and sea turtles, bald eagles and beavers - wildlife found in their home countries. The long mural will represent the connectedness of the planet’s water and the impact that people have on our waterways and the diversity of life they contain. "Teaching children on both sides of the ocean to become good stewards of our environment is one of the most important lessons we can provide - and doing that through art is a powerful first step," said Wyland, who is an official artist for the U.S. Olympic team. Wyland is the current World Record holder as recognized by The Guinness Book of World Records for having painted the largest mural in the world. Whaling Wall #33, "Planet Ocean," covers the entire surface of California's Long Beach Convention Center. At 1,280 feet long by 105 feet high, the 116,000 square foot mural depicts migratory gray whales and other aquatic life found in the waters off Long Beach. At nearly two miles in length, the Beijing mural will be eight times longer than the current record holder. In April, Wyland and Chinese artist Professor Xikun Yuan unveiled giant postcards each had created with more than 1,000 children from their countries to wish each nation good luck with the upcoming games. The two pictures, which measure more than 32 feet in height are shown at the Beijing International Sculpture park. Wyland's whale murals can be seen in more than 70 cities throughout the United States, Europe, Australia, New Zealand, Mexico, and Japan.